A. R. Beaumont and K. Hoare are at the School of Ocean Sciences, Menai Bridge, University of Wales, Bangor, UK. 1. What is Genetic Variation?. 2. How can Genetic Variation be Measured?. 3. Genetic Structure in Natural Populations. 4. Genetic Considerations in the Hatchery. 5. Artificial Selection in the Hatchery. 6. Triploids and Beyond: Why Manipulate Ploidy?. 7. Genetic Engineering in Aquaculture. “Genetical studies of aquatic species for many decades lagged significantly behind those of terrestrial species. In recent years, much more research activity focusing on species in watery domains is evident and this applies both to natural and cultured populations. It is, thus, timely and apposite that a book of this sort should now appear. "...provides an excellent introduction to the topic... The many photographs and drawings help illustrate the often complex concepts and techniques that are presented." Robert R Stickney, World Aquaculture, September 2003. 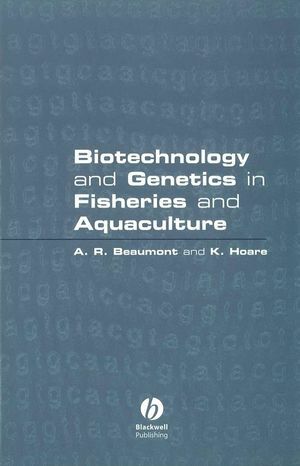 "...an ideal text for relative newcomers to Genetics in Fisheries and Aquaculture that would not be out of place on of bookshelf of those already well established in the field. A good read and excellent value for money." "biotechnology and genetics are just as important in the seafood business as they are in land based aquaculture...It is a complex but vitally important subject which anyone involved with fish farming need to understand very clearly. This book will help them do so."